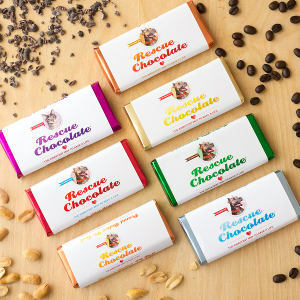 Rescue Chocolate's motto is "The sweetest way to save a life", and that motto couldn't be more apt, as all company profits are donated to various animal rescue organizations. Sarah Gross, the founder/owner of Rescue Chocolate, began volunteering at her local animal shelter while still in junior high. Her love of animals prompted her to become a vegetarian, and 12 years ago she went fully vegan. She founded her company in January of 2010, blending her passion for animal welfare with her love of chocolate, and chocolate-lovers across the country can enjoy her creations knowing that each purchase benefits animals in need. 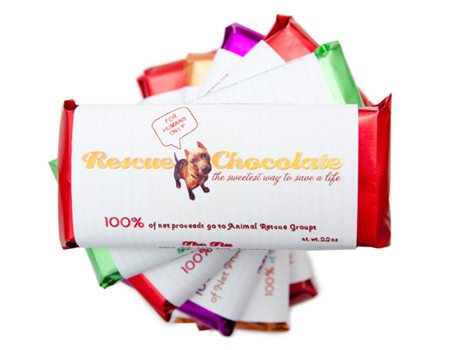 Follow Rescue Chocolate and get notified when they add new offers to Vegan Cuts.